“Pasch” redirects here. For persons with that name, see Pasch (surname). Machine-made matzo, one of the options of unleavened bread eaten on Passover. In Jewish practice, one or two festive Seder meals – first two nights; in the times of the Temple in Jerusalem, the Korban Pesach. In Samaritan practice, men gather for a religious ceremony on Mount Gerizim that includes the ancient Passover Sacrifice. Shavuot (“Festival [of] Weeks”) which follows 49 days from the second night of Passover. Passover (Hebrew, Yiddish: פֶּסַח, Pesach (help·info), Tiberian: pɛsaħ, Israeli: Pesah, Pesakh, Yiddish: Peysekh, Paysokh) is a Jewish and Samaritan holy day and festival commemorating God sparing the Israelites when he killed the first born of Egypt, and is the seven day Feast of the Unleavened Bread (it lasts eight days in the diaspora) commemorating the Exodus from Egypt and the liberation of the Israelites from slavery. Passover begins on the 14th day of the first month of the Hebrew calendar (equivalent to March and April in Gregorian calendar) according to the Hebrew Bible. In the story of the Exodus, the Bible tells that God inflicted ten plagues upon the Egyptians before Pharaoh would release his Israelite slaves, with the tenth plague being the killing of firstborn sons. The Israelites were instructed to mark the doorposts of their homes with the blood of a spring lamb and, upon seeing this, the spirit of the Lord passed over these homes, hence the term “passover”. When Pharaoh freed the Israelites, it is said that they left in such a hurry that they could not wait for bread to rise. In commemoration, for the duration of Passover, no leavened bread is eaten, for which reason it is also called חַג הַמַּצּוֹת (Ḥag haMaẓot), “The Festival of the Unleavened Bread”. 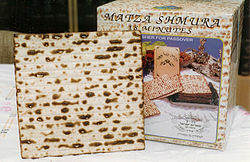 Matza (unleavened bread) is the primary symbol of the holiday. This bread that is flat and unrisen is called Matzo. Together with Shavuot (“Pentecost”) and Sukkot (“Tabernacles”), Passover is one of the three pilgrim festivals (Shalosh Regalim) during which the entire Jewish populace historically made a pilgrimage to the Temple in Jerusalem. Samaritans still make this pilgrimage to Mount Gerizim, but only men participate in public worship. Passover begins on the 14th day of the first month, which corresponds to the full moon of Nisan, the first month of the Hebrew calendar, in accordance with the Hebrew Bible. Passover is a spring festival, so the 14th of Nisan begins on the night of a full moon after the vernal equinox. To ensure that Passover did not start before spring, the tradition in ancient Israel held that the 1st of Nisan would not start until the barley is ripe, being the test for the onset of spring. If the barley was not ripe an intercalary month (Adar II) would be added. However, since at least the 12th century, the date has been determined mathematically. In Israel, Passover is the seven-day holiday of the Feast of Unleavened Bread, with the first and last days observed as legal holidays and as holy days involving abstention from work, special prayer services, and holiday meals; the intervening days are known as Chol HaMoed (“festival days”). Diaspora Jews historically observed the festival for eight days, and most still do. Reform and Reconstructionst Jews and Israeli Jews, wherever they are, usually observe the holiday over seven days. The reason for this extra day is due to enactment of the Sages. It is thought by many scholars that Jews outside of Israel could not be certain if their local calendars fully conformed to practice of the temple at Jerusalem, so they added an extra day. But as this practice only attaches to certain (major) holy days, others posit the extra day may have been added to accommodate people who had to travel long distances to participate in communal worship and ritual practices; or the practice may have evolved as a compromise between conflicting interpretations of Jewish Law regarding the calendar; or it may have evolved as a safety measure in areas where Jews were commonly in danger, so that their enemies could not be certain on which day to attack. Karaite Jews and Samaritans use different versions of the Jewish calendar, which are often out of sync with the modern Jewish calendar by one or two days. In 2009, for example, Nisan 15 on the Jewish calendar used by Rabbinical Judaism corresponds to April 9. On the older Jewish calendars used by Karaites and Samaritans, Abib or Aviv 15 (as opposed to ‘Nisan’) corresponds to April 11 in 2009. The Karaite and Samaritan Passovers are each one day long, followed by the six day Festival of Unleavened Bread – for a total of seven days. The biblical regulations for the observance of the festival, which reflect early postexilic practice, require that all leavening be disposed of before the beginning of the 14th of Nisan. An unblemished lamb or kid is to be set apart on Nisan 10, and slaughtered on Nisan 14 “between the two evenings”, a phrase which is, however, not defined. It is then to be eaten “that night”, Nisan 14, roasted, without the removal of its internal organs with unleavened bread and bitter herbs. Nothing of the sacrifice on which the sun rises may be eaten, but must be burned. The sacrifices may only be performed in Jerusalem. Some of these details can be corroborated, and to some extent amplified, in later postexilic sources. The removal (or “sealing up”) of the leaven is referred to the Passover Papyrus, an Aramaic papyrus from 5th century BCE Elephantine in Egypt. The slaughter of the lambs on the 14th is mentioned in The Book of Jubilees, a Jewish work of the Ptolemaic period, and by the Herodian-era writers Josephus and Philo. These sources also indicate that “between the two evenings” was taken to mean the afternoon. Jubilees states the sacrifice was eaten that night, and together with Josephus states that nothing of the sacrifice was allowed to remain until morning. Philo states that the banquet included hymns and prayers. The verb “pasàch” (Hebrew: פָּסַח‎) is first mentioned in the Torah account of the Exodus from Egypt (Exodus 12:23), and there is some debate about its exact meaning: the commonly-held assumption that it means “He passed over”, in reference to God “passing over” the houses of the Israelites during the final of the Ten Plagues of Egypt, stems from the translation provided in the Septuagint (παρελευσεται in Exodus 12:23, and εσκεπασεν in Exodus 12:27). Judging from other instances of the verb, and instances of parallelism, a more faithful translation may be “he hovered over, guarding.” Indeed, this is the image used by Isaiah by his use of this verb in Isaiah. 31:5: “As birds hovering, so will the Lord of hosts protect Jerusalem; He will deliver it as He protecteth it, He will rescue it as He passeth over” (כְּצִפֳּרִים עָפוֹת—כֵּן יָגֵן יְהוָה צְבָאוֹת, עַל-יְרוּשָׁלִָם; גָּנוֹן וְהִצִּיל, פָּסֹחַ וְהִמְלִיט.) (Isaiah 31:5) Targum Unkoles translates pesach as “he had pity”, The English term “Passover” came into the English language through William Tyndale‘s translation of the Bible, and later appeared in the King James Version as well. The term Pesach (Hebrew: פֶּסַח‎) may also refer to the lamb or kid which was designated as the Passover sacrifice (called the Korban Pesach in Hebrew). Four days before the Exodus, the Israelites were commanded to set aside a lamb or kid (Exodus 12:3) and inspect it daily for blemishes. During the day on the 14th of Nisan, they were to slaughter the animal and use its blood to mark their lintels and door posts. Up until midnight on the 15th of Nisan, they were to consume the lamb. 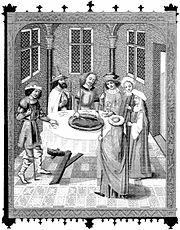 Each family (or group of families) gathered together to eat a meal that included the meat of the Korban Pesach while the Tenth Plague ravaged Egypt. When the Temple in Jerusalem was standing, the focus of the Passover festival was the Korban Pesach (lit. “Pesach sacrifice,” also known as the “Paschal Lamb”). Every family large enough to completely consume a young lamb or Wild Goat was required to offer one for sacrifice at the Jewish Temple on the afternoon of the 14th day of Nisan, and eat it that night, which was the 15th of Nisan. If the family was too small to finish eating the entire offering in one sitting, an offering was made for a group of families. The offering could not be slaughtered while one was in possession of leaven, and had to be roasted, without its head, feet, or inner organs being removed and eaten together with matzo (unleavened bread) and maror (bitter herbs). One had to be careful not to break any bones from the offering, and none of the meat could be left over by morning. Because of the Korban Pesach’s status as a sacred offering, the only people allowed to eat it were those who have the obligation to bring the offering. Among those who can not offer or eat the Korban Pesach are: An apostate (Exodus 12:43), a servant (Exodus 12:45), an uncircumcised man (Exodus 12:48), a person in a state of ritual impurity, except when a majority of Jews are in such a state (Pesahim 66b), and a non-Jew. The offering must be made before a quorum of 30 (Pesahim 64b). In the Temple, the Levites sing Hallel while the Kohanim perform the sacrificial service. Men and women are equally obligated regarding the Korban Pesach (Pesahim 91b). Many Jews observe the positive Torah commandment of eating matzo on the first night of Passover at the Passover Seder, as well as the Torah prohibition against eating chametz – certain leavening and fermenting agents, and things made with them, such as yeast breads, certain types of cake and biscuit, and certain alcoholic and non-alcoholic beverages—but wine is an essential component of Passover, notwithstanding it being a fermented, yeast-bearing beverage. Karaite Jews are not bound by the oral law, under which “chametz” includes not only leavening agents but the grains from which bread is commonly made. Specifically, five grains, and products made from them, may not be used during Passover—wheat, rye, barley, oats, and spelt—except for making matzo, which must be made from one of these five grains. This is because the oral law decrees they begin to ferment within eighteen minutes of contact with water. So, despite pasta not being a leavened product, macaroni products cannot be owned or used during Passover under this interpretation of Jewish Law. Ashkenazic rabbinical tradition also forbids the use of rice, most legumes and new world grains like maize (unknown to the old world when the Bible was written), because they might be made into bread (such as cornbread). Sephardic and other rabbinical traditions do not have this prohibition. Chametz (חמץ, “leavening”) refers either to a grain product that is already fermented (e.g. yeast breads, certain types of cake, and most alcoholic beverages) or a substance that can cause fermentation (e.g. yeast or sourdough). The specific definition varies between religious and ethno-cultural traditions. The consumption of chametz and, under the oral law, its possession, are forbidden during Passover in most Jewish traditions. In Ashkenazic and certain Sephardic applications of Jewish Law, “chametz” does not include baking soda, baking powder or like products. Although these are leavening agents, they leaven by chemical reaction whereas the prohibition against chametz is understood to apply only to fermentation. Thus, bagels, waffles and pancakes made with baking soda and matzo meal are considered permissible, while bagels made with yeast, sourdough pancakes and waffles, and the like, are prohibited. Karaite Jews and many non-Ashkenazic Jewish traditions do not observe a distinction between chemical leavening and leavening by fermentation. To remove all chametz from one’s home, including things made with chametz, before the first day of Passover. (Exodus 12:15). It may be simply used up, thrown out (historically, destroyed by burning, since there was no weekly garbage pickup in ancient times), or given or sold to non-Jews (or non-Samaritans, as the case may be). Observant Jews typically spend the weeks before Passover in a flurry of thorough housecleaning, to remove every morsel of chametz from every part of the home. The oral Jewish law (Halakha) requires the elimination of olive-sized or larger quantities of leavening from one’s possession, but most housekeeping goes beyond this. Even the cracks of kitchen counters are thoroughly scrubbed, for example, to remove any traces of flour and yeast, however small. Traditionally, Jews do a formal search for remaining chametz (“bedikat chametz“) after nightfall on the evening before Passover (which is also the evening that precedes the Fast of the Firstborn). A blessing is read (על ביעור חמץ – al biyur chametz, “on the removal of chametz”) and one or more members of the household proceed from room to room to ensure no crumbs remain in any corner. In very traditional families, the search may be conducted by the head of the household; in more modern families, the children may be the ones who do the search, under the careful supervision of their parents. Because the house is assumed to have been thoroughly cleaned by the night before Passover, there is some concern that making a blessing over the search for chametz will be for nought (“bracha l’vatala“) if nothing is found. Thus, ten pieces of bread smaller than the size of an olive are hidden throughout the house in order to ensure that there is chametz to be found.